Where do we ship domestically? Since most of our products are large and heavy, the orders will be delivered to the curb at the end of your driveway or to an accessible location outside your home. This delivery service does not include set up, assembly of items, and/or removal of packaging. Items will be unloaded by the delivery driver and left on the driveway or at an accessible location outside your home. In the event of an unsuccessful first delivery, a representative from our shipping company will call you to arrange a new delivery date. Upon delivery, please inspect your items and make note of any damages on the delivery receipt. Should you choose to refuse delivery due to damages, please write “Refused due to damages” on the delivery receipt. Orders will be delivered Monday to Friday between 9 a.m. and 6 p.m. Please note, a signature is required for every delivery. 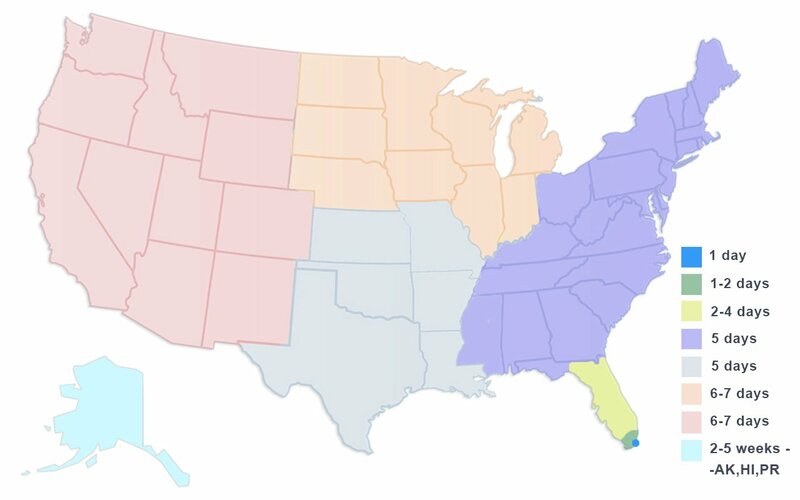 Live near Miami or visiting there? Select Warehouse Pickup during checkout and pickup the next day. Why we don't offer “Free Shipping”? Most of our items are heavy and oversized that require expensive crating and must go by trucking methods. To ensure reliable delivery, we are trying to work with the best and most reliable trucking companies as much as that is possible. Our packaging standards are second to none – probably the best in the industry. We use solid plywood crates with armored steel hinge system for corner protection. Our logistics team is staffed by the most qualified professionals that truly care and will do anything to ensure your orders safe arrival. A significant part of our orders are custom units that require custom package, which could be costly. We reserve the right to assess an additional $150 ferry fee for any orders that require a ferry service. The most common areas that need a ferry for delivery include: Fire Island, Shelter Island, Orcas Island, San Juan Island, Bainbridge Island, Catalina Island and parts of Massachusetts (Nantucket, Martha's Vineyard, etc.). Offshore freight add-on of $750 will apply on top of the continental delivery charges. For instance, a bathtub delivery to Hawaii will be $249 + $750 for a total cost of $999. Delivery normally takes 3-6 business days for in-stock items. Unlike small items and accessories sold by most mainstream Internet stores, bathtubs and spas are bulky and have many parts that require special handling and shipping methods to ensure they arrive in brand-new condition. 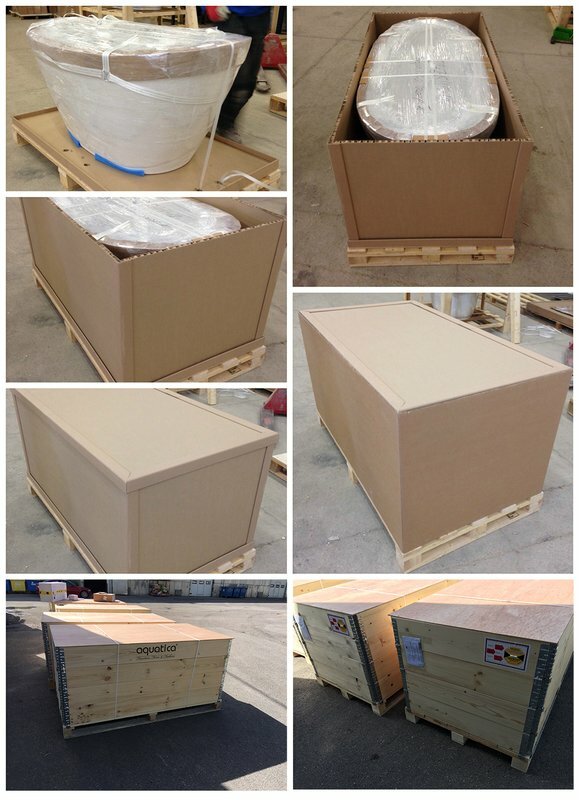 Because of those special shipping methods, our bathtubs and spas usually take longer than smaller items to ship. Below are approximate delivery times based on location. Aquatica also offers you the option of choosing your delivery date. If you'd like your order delivered at a later date, just contact us two weeks prior to the ship date. If you need your order delivered sooner than the times stated above, please contact us and we will do our best to accommodate you. * Delivery times listed above assume that the item ordered is currently in stock. Items out of stock are subject to a later delivery date. * Remote destinations may take longer than the delivery times indicated above. Aquatica reserves the right to determine what is considered a remote destination. Some items on our website are not regularly stocked. Availability on these items will show with longer lead times. Also, any product customization will add to their lead times. If we email you a tracking number during the day, the information may not post to the carrier's website until that evening or next morning. We generally pack orders Monday-Friday. If you receive an email on a legal holiday indicating that your order has shipped, please be aware that your order will ship the next business day. So you've decided that you don't want to pay anyone for installation and that you can handle it on your own! We would like to provide a few helpful tips of what you should do prior to installation to make sure everything goes smoothly. As much as you want to handle the entire installation process on your own, some tasks still need the assistance of a professional. Check for necessary water lines when applicable. If one is not available a plumbing professional will need to install one for you. Electrical requirements are extremely important! Ensure that the voltage/amps of the bathtub or hot tub is something that your home can handle, and if it can’t you will need the assistance of a professional electrician. If you do not possess the proper training and knowledge, do not attempt any of these jobs as the consequences could be dire. Put that measuring tape to good use and get the dimensions of the space where you will be fitting your bathtub or hot tub. Once you have these measurements, cross reference them with the minimum dimensions needed for our tub. This information can be found in the technical specification sheet or installation guide for the unit (which can usually be found under the TECHNICAL DOCUMENTATION section of the product’s page). While you still have that measuring tape handy, check the width and height of all your doorways leading to the room where the bathtub will be installed. You can’t install a tub that can’t make it to the bathroom! Some tubs will also need an extra few inches for access panels and faucet installation, so keep that in mind when choosing the right size for space.